Snippets of My Life: Gifts From Japan!! See, what I got from Diana!!! 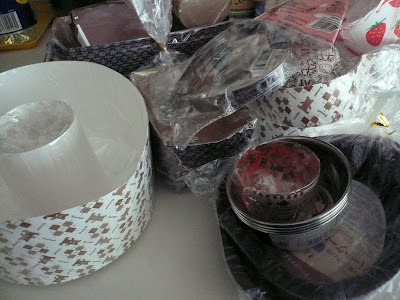 She bought me some baking stuffs and then asked her friend to bring all the way back from Japan. She knew I like collecting different kind of muffins cups and baking pans. Thank you my dear. I will bake you something when you come home o.k. Your niece so sayang you... No wonder every weekend when she was in USA, you cooked for her... Bertuah dapat niece yang sayang kita, kan Gert..??? sayang diana kat auntie dia ye. mesti u tak sabar tunggu dia balik ye Gert? That's very sweet of Diana. I wish I have those stuff in my kitchen too.